The Philips Intellivue MP50 patient monitors give care teams throughout the hospital more of the information they need right at the patient's side. The Philips IntelliVue MP50 provides essential measurements and powerful monitoring capability in a small package to match the unique needs and pace of intermediate care, ambulatory surgery, special procedures, post-operative care, lower acuity environments, and patient transfer. Featuring a highly flexible screen configuration that is designed to suit patient department protocols, acuity, or specific procedure requirements. The IntelliVue MP50 monitors are easy to operate and use on a networked platform via wired or wireless connections. 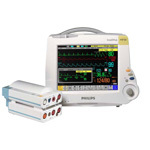 Through Philips intuitive Multi-Measurement Server and extensions, the MP30 delivers the best-in-class clinical measurements including conventional diagnostic 12-lead ECG, capnography, non-invasive and invasive blood pressure, respiration, cardiac output, temperature, BIS, and FAST-SpO2. Questions about our Patient Monitors? Soma Technology, Inc offers a wide range of patient monitors. If you have any questions about any of our monitors or need a quick quote, call 1-800-GET-SOMA and one of our knowledgeable sales representatives will help you.